Quartz has a 3D effect that works wonderfully well on the satin silk of these tunics, and the range of strong yet complementary colours make this a truly unique design. 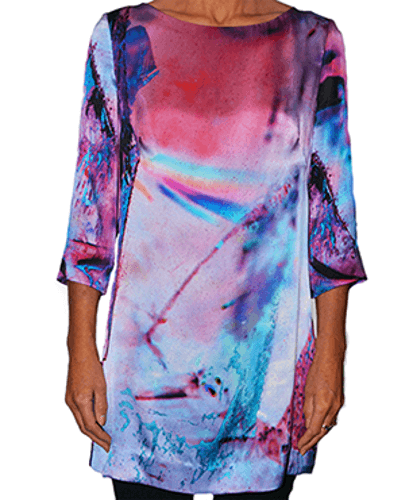 The superb 100% satin silk fabric, excellent design, and high quality manufacturing combine to make this tunic a delight to wear, and it looks good with leggings or black jeans in the daytime, or with cigarette or ‘dressy’ trousers for the evening, although some will choose to wear it as a dress. As the retail price will be £225, we have not scrimped on anything in terms of design, fabric (the same Italian digital printing as our scarves, but a heavier weight), or the quality of manufacturing. Each of the three sizes are slightly on the generous side, and you can, of course, return them to swop sizes, or, indeed, for a refund on the usual terms (return the product in resellable condition at your cost), but we are confident you will find it fits well – and you’ll love wearing it!